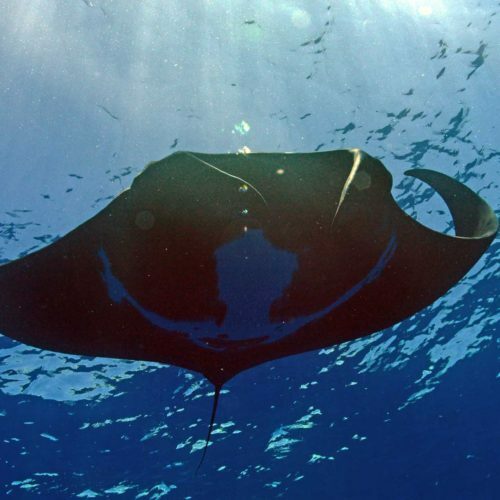 The team of Moorea Ocean Adventures has observed in December 2016 a pelagic manta ray a few miles offshore the north-east coast of Moorea. We have been lucky to swim with this solitary animal a few times during this day and Trevor, guide and cameraman took some close pictures of it at it seems this female was attracted by hs camera. You are about to devote one day at most to the observation of Polynesian marine wildlife. There are many ways to do this (scuba diving, lagoon tours, offshore excursions, observation from the coast) being supervised or not by professionals. Here are our tips for successful sightseeing at sea. Turtles, whales, dolphins, sharks, rays or seabirds are waiting for you!